I first read the title story in The Apex Book of World SF 4 (ed. Mahvesh Murad, 2015) a year ago, and I remember being extremely disturbed by it then. Just a couple of days ago, I read it again, and it was even more frightening. 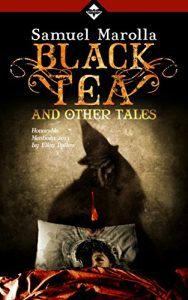 All three stories collected in Black Tea and Other Tales are unsettling and terrifying precisely because they mess with the reader’s own sense of reality. These stories draw on hallucinations, shadows, and coincidences (or are they) in such a way that we’re never quite sure where the threat is coming from. Marolla places the reader in the already disturbed minds of his protagonists, such that we cannot see beyond what they see and experience. We’re along for the ride, and the most terrifying thing of all is that we have no control. In “Crocodiles,” William Fiorucci, a freelance crime journalist with an alcohol problem is given a “gift” by a dying mob boss- the last bit of a special wine that seems to grant (lethal) wishes. Reeling from a series of personal tragedies- his mother’s dementia and the problems she’s causing in the institution where Fiorucci placed her, his divorce and loss of custody of his son- Fiorucci is barely holding on to reality, in imminent danger of losing even his few freelance opportunities. The special wine, though, lets him predict/cause people’s deaths, and that kind of power soon becomes intoxicating. And then there’s “The Janara” (Neapolitan for “bad woman”), a story that begins like a classic case of “kid-hiding-in-the-bed-because-there-might-be-monsters-in-the-closet.” But, of course, the reality(?) is much worse. When a young boy, fascinated by the inmates in the prison his father runs, breaks in and comes face-to-face with an elaborately-tattooed criminal, he is forced to take up the burden (from said criminal) of being hunted by an evil spirit/ghost/demon. Only by following certain “rules,” can he escape her clutches, and even when he succeeds in driving her out of his room for a time, she never truly leaves. You’d better believe that I’ll be hiding under the covers during the next few nights. So go get yourself a copy of this collection and read it during the daytime with a soothing cat purring on your lap and happy sunshine streaming through the window. You’ll still have nightmares, but at least you won’t be so scared while you read.